I was listening to my all-time favorite interviewer, Milt Rosenberg, talk to a few Chicago cops. Like most cops talking in public, this interview starts out a bit stilted, but they open up by the end. 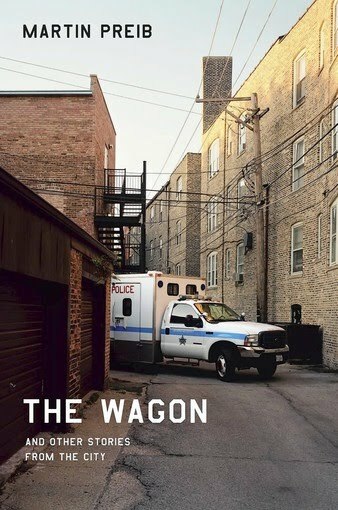 One of the cops, Martin Preib, wrote a wonderful book, The Wagon and Other Stories From the City. I keep meaning to write on it but haven't (his book is not the only thing I mean to write on but haven't). It's great. Buy it. Read it. If you're reading this, you'll like Preib's book. It's not super light reading (published by the University of Chicago) but I mean that in a good way. The guy can write. And it reads really really well. It will stand the test of time. So these guys got me thinking. Brought me back to the old days (shocking to think it's been 9 years since I've walked the beat). Here's one thing I don't miss about being a cop: Hyper-Alertness (I just made that term up). 1) When you walk into a store, is your first thought, "Is the place being held up?" 2) When you're looking in the mini-mart fridge, are you looking in the reflection in the glass to see who enters the store? 3) When you enter a room of strangers, do your eyes move to people's hands? 4) When you sit in restaurant, do you always sit with your back to the entrance, ideally with your back to wall? 5) Do you assume that everybody is lying? 6) Is the thought of taking a nap in a public park completely insane? 7) Do you always carry a heavy badge and credentials? 8) Do you feel a bit naked without your gun? 9) When you're off duty, does the thought of hearing these words terrify you, "I know you!" If you're a cop, you'll say yes to all these things. These are the things that just come natural to cops. If you're a cop, you can't imagine doing otherwise. I quit the P.D. in 2001. It took about two years before I could stop carrying my badge (though during that time I never pretended I was a cop). It took another two years and taking another job (my current job) before I could ignore the above rules and... relax. And remember, I was only a cop for two years (and I'm a pretty relaxed person by nature). Being hyper-alert is part of the job. It keeps cops alive. And if you start being hyper-alert, it's not something you can just turn off in public. But being hyper-alert doesn't make life more fun. Ignorance can be bliss. Sometimes it's nice to tune out. Sometimes it's nice to put on headphones, blast techno music, and ignore everybody around you. Because if you're not a cop, there's a good chance that nobody will hurt you. And you know what? Most people can live all their lives oblivious and unarmed and die peacefully in bed surrounded by loved ones. I don't miss being hyper-alert. I'm happy I'm no longer hyper alert. Though obsessionally something will trigger it. Does not being hyper-alert make me less safe? No doubt. But not being hyper-alert makes me so much happier. I do this. Policemen don't. They assume that certain people are lying and assume other people are telling the truth depending upon how much power and/or money the person has. This is a fundamental difference between policemen and lawyers. That 1st comment is crap imo. unless you happen to know aboutn 830,000 people individually that is. I know I take most of what anyone says with a grain of salt, and I'm one of the less paranoid in my department. On the bulletin board in our squad room is a sign that reads "In God we Trust, everyone else get's patted down". Anonymous is a lawyer, and therefore paid to lie on behalf of the interests of others. Cops assume everyone is lying, and this assumption almost always serves them well. The point anonymous misses is that cops assume everyone is lying, but often find themsleves stripped of the ability to act on the assumption because of the power and money one of the actors has. In general, cops dislike being stoolies to the rich and powerful. But cities get the police departments they deserve, and when citizens elect people who provide access and influence to the rich and powerful, the police are forced to act accordingly. As for hyper-alertness, it is the natural person: the soldier, the cop, the urban bicyclist, the ER doctor, the football player, etc. The rest of society is living half a life, alientated from its more basic nature. Are your CI's reliable or unreliable? Do you believe that Officer Weekley shot Aiyana because he was bumped? I've actually had #9 happen a few times. Luckily they were non-confrontational encounters. The last one was even complimentary, thanking me for being nice when I arrested him. Another good reason to be as decent as they'll let you: There's a chance you'll see them again and the career criminals know which cops are bullies and which are professional. Hyper-Alert is another term for Hyper vigilance, which is one of the symptoms of PSTD. It also means you're the product of good training and survival instincts. God help any officer that has to argue that distinction to a pshrink they've been sent to. And you're absolutely right: It doesn't make life more fun. Hypervigilance is why so many cops have hypertension. Yeah... but I suspect bad eating and sitting in car for 8 hour a day has something to do with it, too.